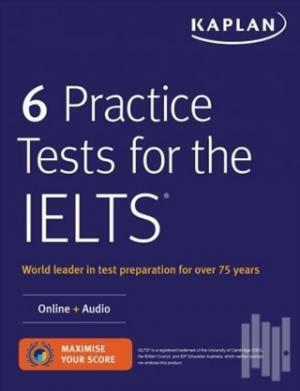 Kaplan's 6 Practice Tests for the IELTS provides printed exams and expert explanations for all four sections of the IELTS Academic test. Realistic practice questions, personalised performance reports, and test-like Listening tracks help you face the exam with confidence. The Most Practice Six full-length practice exams for the IELTS Academic testPractice questions with detailed answer explanations help you build your Listening, Reading, Speaking, and Writing skillsListening tracks for test-like practice on CD and onlineOnline study plan with personalised score reports to identify your strengths and weaknesses so you can customise your studyExpert GuidanceKaplan's expert psychometricians ensure our practice questions and study materials are true to the test.We invented test prep--Kaplan (www.kaptest.com) has been helping students for almost 80 years. Our proven strategies have helped legions of students achieve their dreams. Each year, hundreds of thousands of people in over 140 countries worldwide take the IELTS exam in order to demonstrate English-language proficiency. The exam, which tests listening, reading, writing, and speaking skills, is used for entrance into universities, nonacademic business settings, and as a part of immigration applications for permanent residence or citizenship in several English-speaking countries. The IELTS is an approved English-language test for U.S. and UK naturalization and visa applications.